Is there anyone who doesn’t love Italian food? In this episode, Martha introduces her modern American take on four favorites: eight-layer Lasagna, Chicken Parmesan, Raviolo with egg yolk and Linguine with red or white clam sauce. Each is guaranteed to be a hit with friends and family. 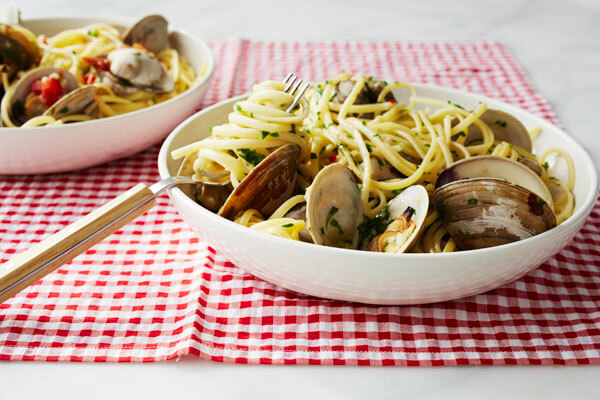 Clams should be tightly shut, clean, and soaked in cold water for at least half an hour to make sure all the sand and grit are out. This chicken parmesan recipe appears in the "Italian Favorites" episode of Martha Stewart's Cooking School. For the Chicken: Whisk eggs in a baking dish. Pat cutlets very dry and season with salt and pepper. Dredge in flour, tapping off excess. Dip both sides in egg, then coat with panko, patting gently to adhere. Place a wire rack on a rimmed baking sheet. Brush cutlets very lightly with oil and arrange in a single layer on rack. Roast, flipping once, until sizzling and cooked through, 8 to 10 minutes. For the Tomato Sauce: In a large pot, heat oil over medium-high heat. Add garlic, pepper flakes, and oregano. Cook, stirring, until garlic is fragrant, about 45 seconds. Add tomatoes and season with salt and pepper. Bring to a boil; reduce heat and simmer vigorously, stirring frequently, until slightly reduced, about 20 minutes. Top each cutlet with basil leaf. Cover with 1/4 cup sauce and sprinkle with 1/4 cup mozzarella. Broil until melted and bubbling, about 2 minutes. Sprinkle with parmesan and basil. Serve immediately.